These are the questions that most studio type condo owners and renters usually get. And it can be frustrating. Sometimes, it seems like a colossal waste of time to make people understand that vertical living doesn’t mean being trapped in a tiny hole. It doesn’t mean being trapped at all. Space, for the highly-creative and ingenious homeowners, is never really an issue. However big or small the space, you can control it. Designing a studio-type condo unit may have its unique challenges, but so does designing for a three-bedroom penthouse unit. Size, in this case shouldn’t matter. While it may seem simpler to redesign the entire condo, there are adjustments you can make to solve the space issue. Creativity, knowing what you want and need, and smart designing tactics matter. If you are looking for a studio-type condo design that works for you and your lifestyle, keep on reading. No, you are not limited to a small bed, a small table, and probably a floor lamp in a corner. Your place can be as cozy as you want it to be. Here are efficient ways to arrange furniture and ways to make the most of studio-type condo spaces. 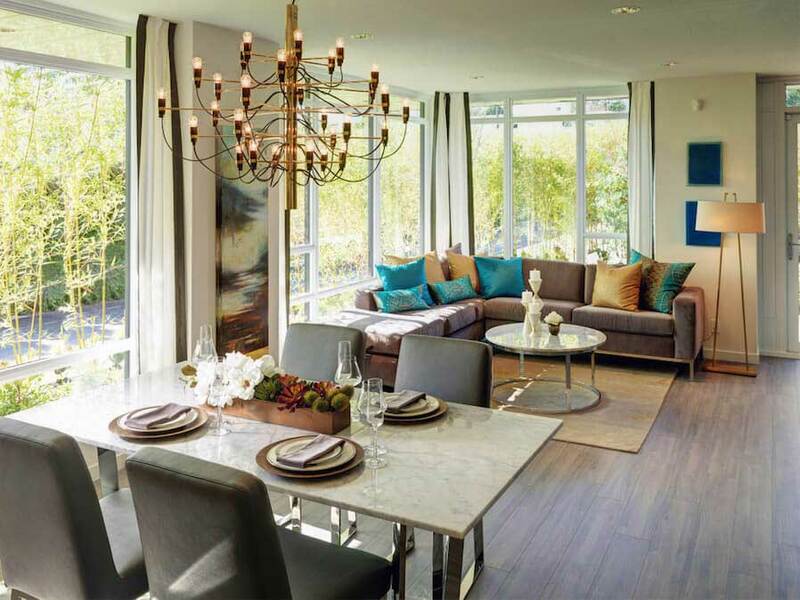 An open-space floor plan is becoming more popular among condo owners. This layout is a free-flowing and functional design. It is compact but does not feel crowded. In most cases, the open-floor plan is the combination of the kitchen, dining, and the living room areas. In a studio condo however, this includes the bedroom. Among the benefits of open living is that it naturally integrates everyday living. This means you can cook and watch TV from the living area at the same time. Less walls and dividers also encourage natural light to flow through the unit. And because no room is confined, even a studio can create the illusion of a bigger space with this design layout. 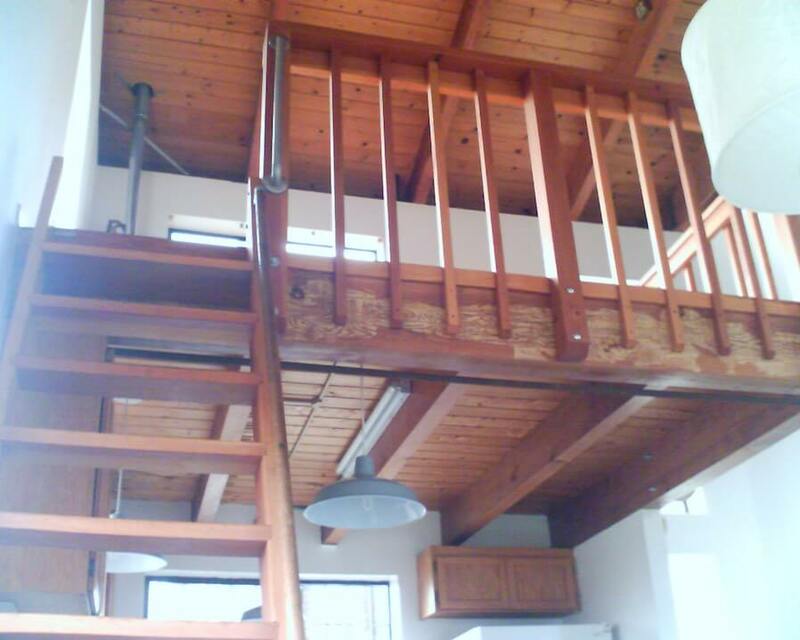 One of the best arrangements for studio-type condos is having a loft or mezzanine. This is especially achievable in units with high ceilings. A loft apartment is both classic and chic, and several architectural perks come with its innate flexibility. The industrial-type details make this layout interesting and functional. You can set up your bedroom on top and maintain an office downstairs. Make the space look bigger and more functional by having in your condo. Arrange your furniture by function. For example, if you have a desk for office work, keep it close to a bookshelf and a couch where you can easily lay down and read a book. Keep the dining table close to the kitchen. For some people, bedrooms are extremely private spaces. You can take a peek into everything but bedrooms are off-limits. But if you are designing a studio-type condo, privacy can be a little hard to achieve. What you can easily do is to get a stylish divider to set the bedroom apart. 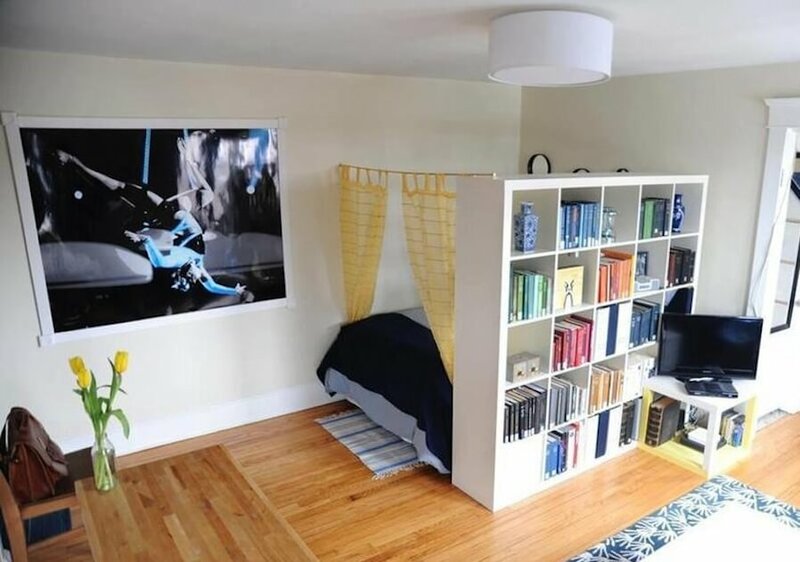 If possible, get one that serves double duty such as a shelf for books and other knick knacks. You can also go for a trunk or a chest that can double as your night table. You may be wondering where to place all your furniture. How about float them? This will save a lot of space. Mount your TV on the wall instead of setting up a bulky home entertainment center. You may also float the speakers, DVRs, and movie collection. Instead of traditional shelves, get floating shelves for your books, office supplies, and frames. You can even use this as a basis for a sci-fi design theme. If you can’t place your furniture anywhere or can’t float them, why don’t you hide them? 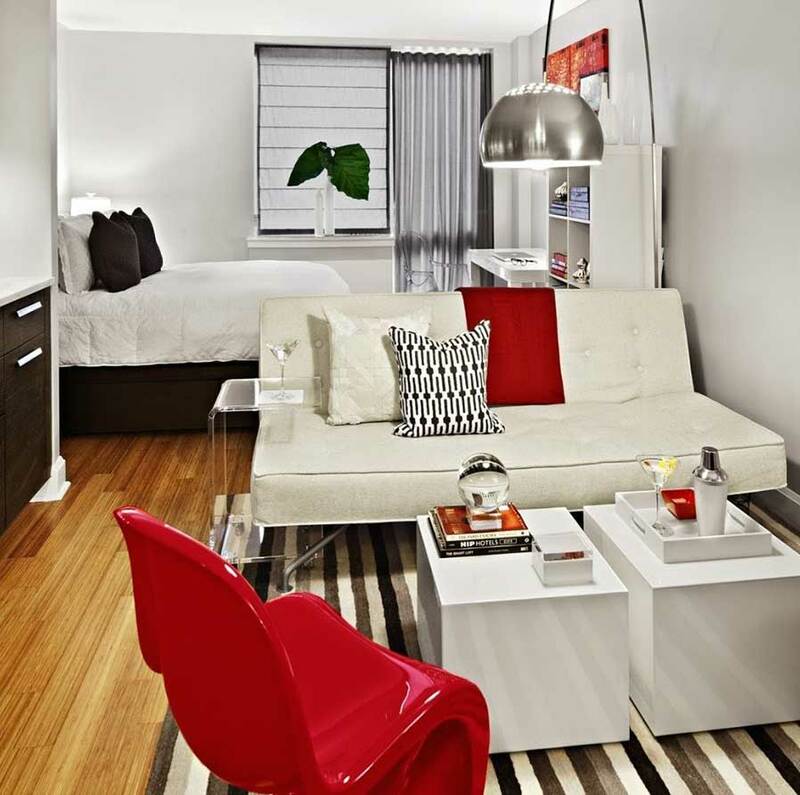 You would be surprised at the wide array of furniture specifically designed for small spaces. There are tables you can fold, an ottoman that can be turned into a center table, and even a bed that that you can hide inside a wall. It is very common to simply press the couch against the wall. You would think that you are saving space. 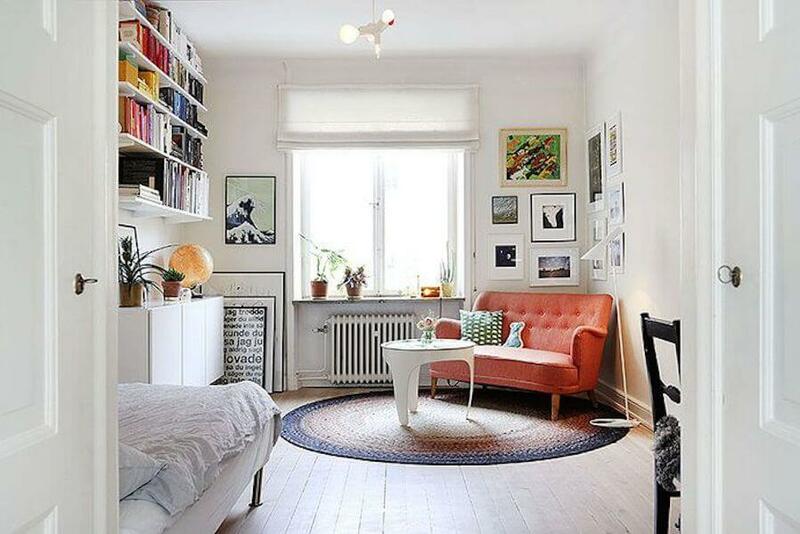 But actually, moving away from the walls will make the impression that you have a bigger space. You have to create space beyond the furniture to add volume to a room. For example, one living room design that you can do is to put the living room pieces at the center. You can put a slender cabinet against the wall and behind the sofa instead. Do not limit focus on horizontal dimensions. One living room design that can effectively turn a small space into a bigger one is by putting emphasis on the vertical. Ceiling to floor window drapes and tower-high shelves can help you achieve this. Small should not mean muddled and chaotic. Make sure to still distinguish key areas in the condo. One of the simple ways to do this is by using a carpet. This acts like an in-between and marks the start and ending of an area. 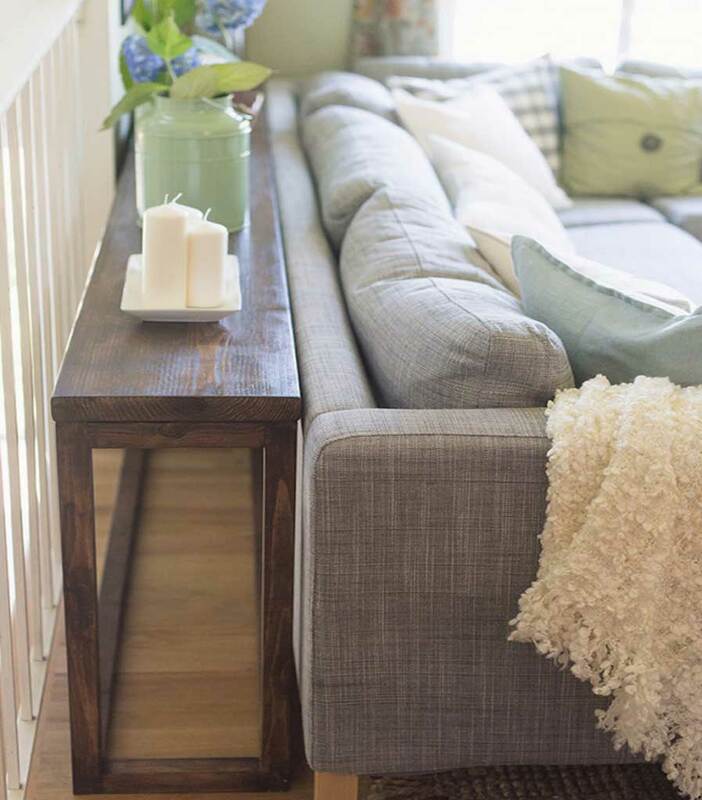 Forget the typical bulky couches and a coffee table. What you can do is put together your living space in a window niche. Choose slender, narrow, and long bench, much like a breakfast diner. 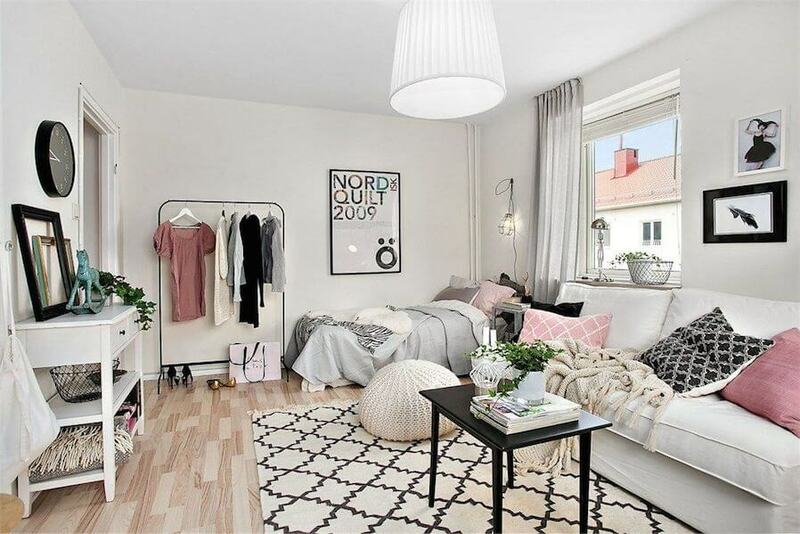 This will take up less space and give the unit a really chic vibe. Do not think that you can save much space by using several small pieces. If you don’t know how to use them well, the space will still look cluttered. You can simplify the space by using few large pieces such as a love seat and a coffee table. But that’s it. Do not add two more small pieces such as another chair or an ottoman. One of the challenges of designing for small spaces is how to identify clear traffic paths. When there’s too much going on in a rather tight space, you seem to not know how to move around. 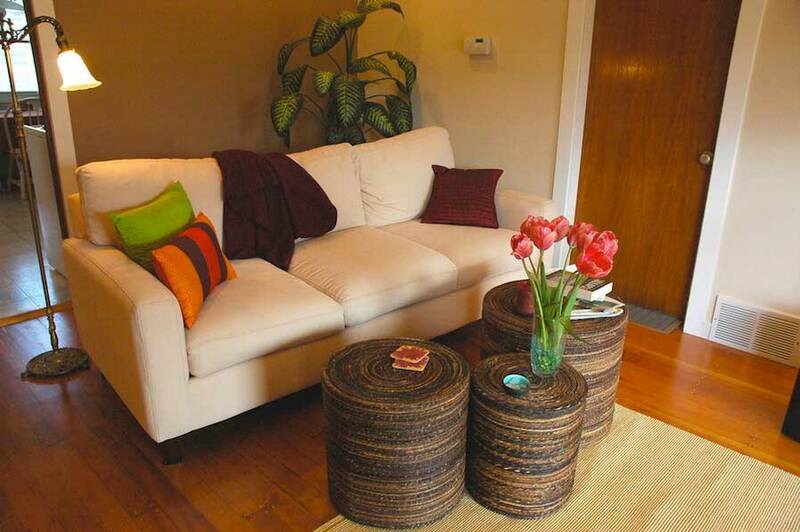 When arranging your furniture, it is important to create a path for traffic and flow of people. This can be made possible by directing traffic to a center rather than through it. If your “center” is the living room with the sofa as the starting point, traffic from the door should be directed towards it. Small can be beautiful. It is greener, more efficient, more functional, and more economical. Never let the actual space limit your imagination of what your home can become.